To watch 4/5 years old children playing chess at HoMath and Chess, click HERE. To watch 4/5 years old children working on HoMath and Chess worksheets, click HERE. 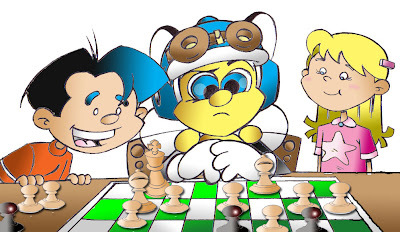 Click HERE to watch video on how chess benefits children. We use special school version of Chess and Math puzzles worksheets for elementary schools. Paying one fee, the students get benefits in chess learning plus the improving of problem solving ability - a great deal. We are always interested in finding qualified chess instructors, please email your resume to mathandchess@telus.net, attention to Frank Ho or phone him at 604-263-4321. Thank you. We are the world leader in math and chess integrated research and teaching. We strive to promote learning with fun using chess as a teaching tools. We do not get any government funding in our research. Supporting us means to promote chess since part of the proceeds will be used in our continued research in the area of integrated math and chess teaching and learning. We thank you and appreciate for your continued understanding and support. Ho Math and Chess also offers lunch hour or after school chess programs to elementary schools. improve problem solving ability and critical thinking ability. In British Columbia, Canada we offer noon hour chess programs at Tennyson Elementary school and L'Ecole Bilingue Elementary school. Summer program at St. George's (over 10 years), Dunbar Community Centre. We also teach at Sunset Community Association. In USA, school chess program is offered at Lloyd school, Chicago, Illinois. Ho Math Chess does not just teach math and chess under one roof and called itself Math and Chess , the founder Frank Ho had a vision to integrate chess into math curriculum and in the past over 10 years, Frank devoted his time and energy in this area and today Frank Ho is the leading authority in the field of math and chess integrated teaching with many publications and research papers and also some unique and innovative inventions namely Frankho Geometric Chess Language, Frankho Chess Mazes and a brand new chess training set for young children. Ho Math Chess has "whole" lot of more to offer than just math and chess. Elementary school Children! You have suffered long enough by continuing to work on "drill to kill" worksheets. Using our innovative way of teaching math by integrating math, chess, mathematical chess puzzles, IQ puzzles, word problems, math contests problems, you are guaranteed to have a new and fresh look on how math is taught at Ho Math Chess. Ho Math Chess program offers children the opportunity to learn math and chess at the same time, its purpose is not to train children to become professional chess players, but to raise their higher level thinking skills, train their brain to think deeply, train children's mental state to be more alert when working on analytical problems. Ho Math Chess does not just use chess as a teaching tool, but also uses its world's first math and chess integrated workbooks to teach computation ability and train children to master basics in a fun and entertainment way. Chess has been known to be an useful tool in raising math marks and problem-solving skills. At Ho Math and Chess, we have created a very unique and scientific proven teaching method that is to teach math and chess at the same time by using a truly math and chess integrated workbooks. This set of workbooks is to raise children's math ability by taking the boredom out of doing repetitive math drills and also foster a fun yet educational environment. Children learn best while having fun. This is an incredible chess workbook for children. Our own anecdotal evidence suggests that our unique math and chess integrated workbooks can be an effective teaching method in helping child diagnosed with ADHD or ADD or child with learning difficulties such as dyslexia. The results are most significant when the child is placed in an education environment of one-on-one tutoring. Many findings have supported that pupils who find it hard to maintain concentration on a single activity are able to improve this focus on playing chess. Click the following sites for more information on how chess could help ADHD, ADD, and dyslexia. Ho Math and Chess has invented a series of workbooks which truly combines math and chess and a child can learn math using chess knowledge on a variety of puzzle-like problems. These type of problems includes visual image (not just pure numbers), chess symbols, abstract chess values and chess directions and all these are stimuli to kids and keep their interests high while working on computational problems. This also gives children ample opportunities to think visually. Most of the time, the computational questions themselves are not written for children to work on immediately but for children to "create" themselves and these questions have to be actually "hunted" by following directions and chidren love the hunt (puzzles). Ho Math and Chess workbooks magically keep children's attention span longer than a typical math workbook could. Children become more engaged and focused when working on math and chess integrated workbooks than on traditional computation workbooks. By providing math and chess truly integrated workbooks, Ho Math and Chess allows children playing chess while working on math in a fun and also educational setting. The end results are children get to strengthen their working memory and improve their problem solving ability. Doing something children like, they are able to concentrate and improve their ability to focus and allow themselves to immerse in the activity longer. Ho Math and Chess truly integrated workbooks may be just one of the very effective teaching model for a child with problems of ADHD, ADD, or dyslexia. Ho Math and Chess created the world's famous math and chess integrated workbook for kindergartners and juniors. This unique workbook is created by using proprietary Symbolic Chess Language. Click here for video clip on how to use math and chess integrated teaching method to boost children's intelligence. Ho Math and Chess specializes in teaching beginning math program by creating the world’s first Kinder Magic Chess and Fun Math Puzzles workbook using the proprietary Symbolic Chess Language to link math and chess. Studies have showed that chess and math can be used as a training tool to improve children's brain power and is a great tool for brain exercise. Ho Math and Chess Magic Chess and Fun Math Puzzles workbook is created as an excellent brain power training tool and engine to improve children's brain power and as a result, it can improve children's critical thinking ability and also their IQ and EQ scores. The research results of using this math and chess integrated teaching method have shown statistically significant impact on raising children’s math ability and thinking skills. Lesson will be held in a dedicated chess teaching room especially designed for kindergartens or pre-schoolers with no distractions from other classes. Improve the understanding of math concepts through learning chess game. Unlock true potential of problem-solving ability. Mastering math basics skills in the subjects of basic arithmetic operations, symmetry, number relations, logic, spatial relation, symbols, image processing, patterns and sequence, comparisons, set theory, multi-step puzzles etc. and much more. Learning basics of chess. Learning problem-solving techniques using chess and math integrated problems. Learning the skills on how to solve mathematical chess puzzles. Please phone your local Ho Math Chess to find out details about the program. In Vancouver west side, please phone Frank Ho at 604-263-4321. For any other locations please click HERE.